The Global Drug Delivery Partnering 2010-2018: Deal trends, players and financials report provides comprehensive understanding and unprecedented access to the drug delivery partnering deals and agreements entered into by the worlds leading healthcare companies. The Global Drug Delivery Partnering 2010-2018 report provides comprehensive understanding and unprecedented access to the drug delivery partnering deals and agreements entered into by the worlds leading healthcare companies. This report provides details of the latest Drug Delivery agreements announced in the life sciences since 2010. The report takes the reader through a comprehensive review Drug Delivery deal trends, key players, top deal values, as well as deal financials, allowing the understanding of how, why and under what terms, companies are entering Drug Delivery partnering deals. The report presents financial deal term values for Drug Delivery deals, listing by headline value, upfront payments, milestone payments and royalties, enabling readers to analyse and benchmark the financial value of deals. The middle section of the report explores the leading dealmakers in the Drug Delivery partnering field; both the leading deal values and most active Drug Delivery dealmaker companies are reported allowing the reader to see who is succeeding in this dynamic dealmaking market. One of the key highlights of the report is that over 1,800 online deal records of actual Drug Delivery deals, as disclosed by the deal parties, are included towards the end of the report in a directory format – by company A-Z, stage of development, deal type, therapy focus, and technology type - that is easy to reference. Each deal record in the report links via Weblink to an online version of the deal. The initial chapters of this report provide an orientation of Drug Delivery dealmaking. Chapter 1 provides an introduction to the report, whilst chapter 2 provides an overview of the trends in Drug Delivery dealmaking since 2010, including details of headline, upfront, milestone and royalty terms. Chapter 3 provides a review of the leading Drug Delivery deals since 2010. Deals are listed by headline value. Where the deal has an agreement contract published at the SEC a link provides online access to the contract. Chapter 4 provides a comprehensive listing of the top 25 most active companies in Drug Delivery dealmaking with a brief summary followed by a comprehensive listing of Drug Delivery deals announded by that company, as well as contract documents, where available. Chapter 5 provides a comprehensive and detailed review of Drug Delivery partnering deals signed and announced since Jan 2010, where a contract document is available in the public domain. Each deal title links via Weblink to an online version of the deal record and contract document, providing easy access to each contract document on demand. 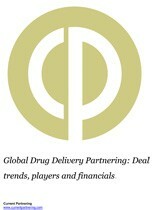 Chapter 6 provides a comprehensive and detailed review of Drug Delivery partnering deals signed and announced since Jan 2010. The chapter is organized by specific Drug Delivery technology type. Each deal title links via Weblink to an online version of the deal record and where available, the contract document, providing easy access to each deal on demand. A comprehensive series of appendices is provided organized by Drug Delivery partnering company A-Z, stage of development, deal type, and therapy focus. Each deal title links via Weblink to an online version of the deal record and where available, the contract document, providing easy access to each deal on demand. The report also includes numerous tables and figures that illustrate the trends and activities in Drug Delivery partnering and dealmaking since 2010. In conclusion, this report provides everything a prospective dealmaker needs to know about partnering in the research, development and commercialization of Drug Delivery technologies and products. Global Drug Delivery Partnering 2010-2018: Deal trends, players, financials and forecasts is intended to provide the reader with an in-depth understanding and access to Drug Delivery trends and structure of deals entered into by leading companies worldwide. The Global Drug Delivery Partnering 2010-2018: Deal trends, players, financials and forecasts report provides comprehensive access to available deals and contract documents for over 1,800 Drug Delivery deals. A full explanation of license type definitions can be found here. We guarantee our prices are competitive. If you find the same report advertised at a lower price within 7 days of purchase, we will refund the difference. If an update is published within 30 days of your purchase, you will receive it absolutely free of charge. All card payments are processed by SagePay. If you have any questions about your report or are unhappy with the quality, we will do our best to resolve your query. Contact us direct. Current Partnering is part of Wildwood Ventures Ltd., based in York, United Kingdom. We have been trading successfully online since 2009 and work with some of the most famous brands in the business. We carefully select our partners to ensure that the publications meet expectations of demanding customers. © 2019 Wildwood Ventures Ltd.